A default CentOS 7 instance comes with a graphical user interface (GUI) installed. However, in case you have decided to skip the GUI installation, or are using a minimal distribution, you can always set up your visual environment later. As CentOS is a distribution typically aimed for systems administrators, most users prefer working on their system over the terminal. However, we’re writing this article today for those who’d still prefer to have a visual interface to interact with their cheap CentOS 7 server. Let’s start by executing the command- yum group list to see what’s available. 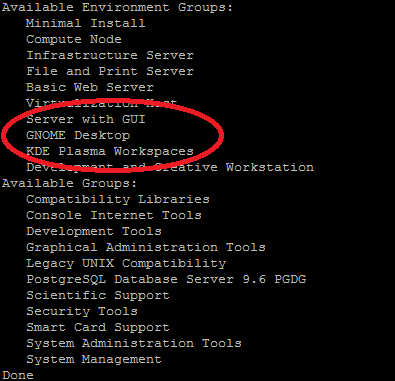 We recommend you go for GNOME Desktop. If GNOME is not available, you can use the command- yum groupinstall “X Window system” to install the X Window system. This will take some time to install. Once this is done, execute the command- startx. This is used to start the GUI. Option #2- Use the command systemctl set-default graphical.target and reboot the system. After reboot, click the button next to Sign In. Select GNOME from the list. Click Sign in and you will have logged in with a GNOME shell. Here is a list of systemd targets with the specific level defined. By default, this is set to level 3 and in order to use a GUI we must change it to level 5. Reboot the system and you will be able see the KDE desktop environment up and running. Then, use the command- yum install cinnamon -y to complete the installation. Once the installation is complete, you can use following commands to start the GUI. The Cinnamon desktop will be seen on reboot. As usual, the first time you use it you will have to set language preferences, among other things. Once installed, you can execute the following commands to start Xfce. That’s it. We’ve given you a rundown of the different desktop environments available for CentOS 7, and how to set them up. We hope you’ve found this useful!